Rosendaelsche Golf Club is one of the oldest clubs in the Netherlands (formed in 1895) and its members originally played between the Rosendael manor and the Velpse Geërfden grounds in the neighbourhood of Emma-piramide. In 1908, the club moved to Arnhem but, despite the relocation, the name of Rosendaelsche Golf Club was retained. 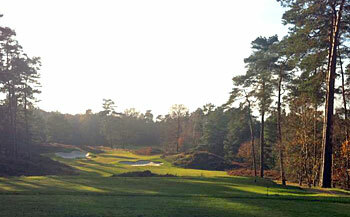 The landowner was Mr A.A. Delcourt van Krimpen and his course was described in 1939 as being laid out “on beautifully undulating terrain with high rising trees and soft green fairways.” It is indeed a wonderful woodland setting within Valkenhuizen Forest, on the fringe of the De Hoge Veluwe National Park. English architect Frank Pennink extended the course in the mid-70s to an 18-hole layout, a few years before the new clubhouse was built. Shortly after that, Bernard Langer established a course record that still stands on his way to winning the Dutch Open in 1984. The club motto of ‘qui va adroit ne manque’ translates to English as “who goes straight doesn’t miss” – very appropriate for a course where beech, birch and pine tree-lined fairways have to be negotiated from start to finish! Rosendaelsche is heathland golf at its very best, played over gently undulating forested terrain with heather-clad ridges creating the odd semi-blind tee shot or approach shot. The holes seem to get stronger as the round progresses, particularly so between the long, tight, par four 14th and the downhill, par three 16th. Rosendaelsche was the one course that I really missed playing when I visited some of the top courses in the Netherlands last year so I was really happy to get the chance to tee it up here last week. It was only extended to an 18-hole layout in 1977 but you’d think all of the holes dated back to when the club moved here in 1908. Indeed, two brand new holes that were installed by Christoph Städler only a couple of years ago already look as though they’ve been in place for a very long time! These two new holes in the northernmost part of the property (the par three 6th and left doglegged par four 7th) replace the old 4th and 7th holes that were taken out to make way for a fantastic new practice facility close to the clubhouse, featuring an enlarged putting green, an extensive short game area, four short holes and a new driving range. The course is conveniently located just off a busy road junction to the north of Arnhem, within a protected area of forests, heathlands and sand drifts called the National Park Veluwezoom. Apart from the sound of traffic on the opening and closing holes of each nine, you’d be hard pressed to realize such a charming wooded heathland setting was only a 15-minute drive away from a large city centre. Tree management is a thorny issue affecting many clubs nowadays and Rosendaelsche has met this vexing challenge head on in recent years, thinning out and removing many of the trees that hinder heather regeneration and prevent light and air reaching the greens and fairways. This work is far from finished but so far the resulting agronomic improvements are an absolute joy to behold. Architect Christoph Städler’s design company has also been involved in bunker renovation work around the layout and this too is of a very high order. It’s not easy to make a course aesthetically pleasing and fun to play for the members and at the same time retain the capability of providing a strong championship test for competitive play but Rosendaelsche realizes both objectives with ease. I really loved the first three holes, involving blind tee/approach shots to emphasize the rolling nature of the terrain, but I thought the new Städler holes were the best on the front nine, especially as they replaced a rather boring par four and an uphill par three that were easily the weakest two holes on the card. On the down side, I wasn’t too keen on the big tree to the left of the green that totally dominates the par three 9th hole. The back nine opens with a great couple of par fours, the second of which involves a blind tee shot over a heather-clad hill on a tight, visually demanding fairway. The short par four that follows on the 13th was maybe my favourite on the course, severely doglegging left to a green that’s perched along a ridge with falloffs on all sides of the putting surface. The short, downhill 16th is a leading candidate for “signature hole” status but the expired battery on my mobile prevented me from taking a snap! Rosendaelsche climbed an impressive twenty-six places into the Continental Europe Top 50 when the rankings were revised at the end of last year. In fairness, a number of other old Dutch Masters greatly enhanced their position within that particular chart, which is as clear an indication as any that the top tracks in this country have been grossly underestimated for a number of years now. Good balance to the course with holes of a consistently decent quality. Didn't like the Par 3 9th with a great big tree in front of the green, but liked many others. Holes that stick in the memory were the 13th with its tee shot down a valley and second shot back up the hill to a raised green that falls away to the left, and the postcard Par 3 16th. Can't decide if I prefer this one to the Hilversumsche, not much in it. This course is on a better piece of land, has a nicer routing, and slightly more fun, but Hilversum seems to have a bit more of something. Just not exactly sure what this is. When I arranged to play a round at De Rosendaelsche Golf Club, I was surprised to find that the club is not located at Roosendaal as I had always expected. Sure it doesn’t take a rocket scientist to realize the spelling is slightly different, however in my defense we are in the Netherlands and Dutch spelling doesn’t always follow expected rules. It turned out that De Rosendaelsche Golf Club is in Arnhem near the village of Rozendaal. Luckily, the distance from Amsterdam was about the same, but an hour’s drive southeast. On arrival at the club I noticed two things. First of all the freeway literally exits right onto the front doorstep of the club and secondly, as I’d been warned, they are in the process of renovating everything, which is not always a good thing. I was informed immediately that De Rosendaelsche Golf Club has the oldest golf course in The Netherlands, dating back to 1908 (the club itself dates back to 1895). This is an interesting fact because it naturally means the course predates the highway by many, many years. I’m developing an intense dislike of noise pollution from government highways that have failed to take golf courses into consideration in the Netherlands. Anyway, it’s not the club’s fault that this freeway is on its doorstep and while De Rosendaelsche is blessed with some of the most beautiful land in The Netherlands, the road noise is, sadly, unavoidable. Unfortunately, De Rosendaelsche has garnered a reputation for being satisfied to be the oldest course and has traditionally followed a rather frugal development and maintenance policy. I would like to make one thing clear. This is no longer the case. De Rosendaelsche is implementing major improvements to bring this beautiful course up to the highest championship standard. Many of these improvements are already visible, for example Christoph Städler, a renowned German golf course architect, has reshaped all the bunkers on the course – he’s also responsible for the overall renovation programme. I have to say there is nothing better than a classic course that is renovated by someone who respects the original design and does a fantastic job of complementing the playability of the course and the aesthetics. The new bunkering at De Rosendaelsche is a real improvement, both functionally and aesthetically pleasing. Review by David Davis (Top 100 Benelux correspondent – click here to read the full story. As a member of this club, I think i can provide some valuable information. There really has been some hard working on the quality of the course. The lay out has always been magnificent, but the greens have been great all year long and the fairways have been great as well. those factors used to be liabilities in the past, but there has been a lot progress. I always think it's a shame that so many greens have few undolations, although the course is challenging enough. I highly recommend this course to every player, i think it's a good match with Hilversum and the Pan for example.